Baseball stumbled into a pair of incredibly unfortunate scheduling conflicts. MLB starts the second round of their Postseason on Friday with Game 1 of the NLCS between the Los Angeles Dodgers and Milwaukee Brewers. The ALCS between the Boston Red Sox and Houston Astros begins with Game 1 on Saturday. As I was looking at the schedule for the round, the beginning of each series has conflicts with other sporting events, specifically football, which shouldn’t come as a shock to anyone given that, you know, it’s football season. But then I started looking at the actual matchups that the NLCS and ALCS are up against…and man, this is gonna be a problem. Friday night’s NLCS Game 1 has competition from USF-Tulsa on ESPN, but that’s not going to do much damage to the game’s viewership. Saturday is where the matchups start to get real interesting. On a loaded day of college football, Game 2 of the NLCS doesn’t have a college football lead-in on Fox. The lead-in for the Dodgers-Brewers matchup? Truck Series racing, of course! Meanwhile, right when the MLB pregame show is starting on Fox at 3:30 PM (ish) ET, Georgia-LSU will be kicking off on CBS, Michigan State-Penn State begins on BTN, and Washington-Oregon starts on either ABC or ESPN2. Just for the hell of it, NBC is getting involved with the competition, airing Pitt-Notre Dame starting at 2:30 PM. But at least the Brewers aren’t going up against the Wisconsin Badgers – they play Michigan at 7:30 PM, so a longer game could cut into that audience (and also dissuades Brewers fans from watching Game 1 of the ALCS). The ALCS won’t have much competition on Saturday night – the college football schedule doesn’t look that great, aside from the aforementioned Wisconsin-Michigan matchup (and maybe Miami-Virginia, in case that’s your sort of thing). The Houston Cougars *do* play at 7 PM ET Saturday on CBS Sports Network, about an hour before the start of Astros-Red Sox. Sunday is where things get a little more interesting. There’s just one MLB game – Game 2 of the ALCS. It starts at 7:09 PM ET, an hour or so before Sunday Night Football kicks off, which was expected. The problem with that? A certain team called the New England Patriots are playing on Sunday night, taking on the Kansas City Chiefs. 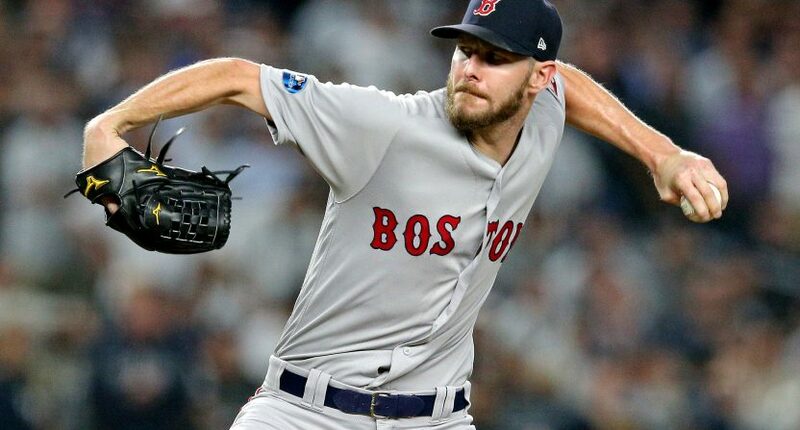 Boston sports fans will have a tough decision when 8:20 PM ET rolls around – keep watching the Red Sox, or switch to the Patriots? (of course, it’s not a zero sum game – streaming does exist, as do remote controls) If the Red Sox are losing or the game is boring, fans could just switch to football and punt on the rest of the baseball game, no matter how much more important it is in comparison. That brings me to Monday, where things just get stupid. Game 3 of the Brewers-Dodgers NLCS starts at 7:39 PM ET. Monday Night Football starts 36 minutes later. The San Francisco 49ers playing on Monday night, and they’re playing…the Green Bay Packers. Yep, Wisconsin sports fans will get a half hour of the Brewers’ ninth NLCS game in 35 years before having to decide between baseball and football. Now that’s just mean. The same issues apply here as did in the Sunday night conflict for Boston fans – if the Brewers are down early, fans might flip over to football and not dedicate their time until baseball again until halftime (if at all). Making fans choose between one or the other is just brutal. In lovely news for MLB, the Celtics and Red Sox play in different windows on Tuesday, though the nationally televised Rockets game on Wednesday starts a half hour before Game 4 of the ALCS. This is really nobody’s fault. Baseball had no idea back at the beginning of August when they announced the dates for Postseason games that two of the four teams that would eventually make the LCS would end up going head to head with NFL teams in their own market in primetime (though, let’s be honest here – the Red Sox had the best record in the AL on August 2nd, and the Brewers had the second best record in the NL. It wasn’t a stretch). MLB could have looked at the potential conflicts and swapped dates for the NL and AL playoffs before announcing the schedule, but that probably would have ended up wreaking havoc on Fox’s college football and NFL schedules in October. If there’s a bright side for baseball, it’s this – the college football schedule during the World Series does not look great (Florida-Georgia, in the afternoon, Iowa-Penn State, and Texas-Oklahoma State are the highlights), the Sunday Night Football game during the World Series is fine, but not a guaranteed ratings smash (Saints-Vikings), and the national NBA schedule during the nine possible days the World Series could run is less than appealing (76ers-Bucks is the best matchup on a World Series game day). How the schedules fell is quite unfortunate for baseball, but somehow, it could have been so much worse.